We still talk about the Tigers as a team headed off a cliff, and it’s no mystery why. The reasons are the same as they’ve ever been, and the longer-term outlook remains unpleasant. Yet the team might not get enough credit for what it was able to do in the middle of a down 2015. Yoenis Cespedes was turned into Rookie of the Year Michael Fulmer. And David Price was turned into breakout candidate Daniel Norris and wild but hard-throwing Jairo Labourt. Oh, and Matt Boyd was a part of that, too. Boyd was intriguing to me at the time, just because of the success he’d had at the highest levels of the minors. He was written about as a low-upside type, yet he still seemed like a major-league starter. Granted, as a major-league starter in 2015, Boyd nearly allowed a run per inning. That’s terrible! Last year’s version settled down. Boyd kept his ERA in the mid-4s, and right now he’s in there for a rotation spot. For my taste, Boyd continues to intrigue. I’ll explain why, because that’s what we do here, and I want to say right now that Boyd, as is, isn’t anything special. But he’s close. Fulmer and Norris get the bulk of the attention, but Boyd could be ready to emerge. He has one step left to take. Below, a plot. I make a lot of plots. You wouldn’t think anything of someone citing a pitcher’s strikeout rate. Strikeouts, however, have two components. One, a pitcher needs to get into strikeout counts. And, two, a pitcher needs to take advantage of said strikeout counts. In this plot, a breakdown. On one axis, I’m presenting the rate of pitches thrown with two strikes. On the other axis, I’m showing the rate of those pitches, specifically, that turned into strikeouts. Boyd is highlighted in the Excel equivalent of Tigers orange. There are 317 different pitchers who threw enough pitches to qualify for my sample. Boyd ranked 14th last season in two-strike rate. However, at the same time, he ranked 293rd in two-strike strikeout rate. Let me give you some frame of reference: In terms of getting into favorable counts, Boyd ranked by Max Scherzer and Seung Hwan Oh. In terms of converting said favorable counts into strikeouts, Boyd ranked by Jeanmar Gomez and Alfredo Simon. Boyd wasn’t the most extreme pitcher in this regard, but he was the most extreme starter. The plot shows a bunch of numbers. Converted into plain English, Boyd demonstrated that he could consistently work ahead. He got into good situations. What he didn’t have was a reliable method of putting hitters away. That’s not, of course, something that’s easy to develop, but you could say Boyd has done the hard part. He’s getting hitters on the defensive. He just needs to tighten something up. You can see this in some other areas. Hitters stood and watched Boyd’s curveball three-quarters of the time he threw it. 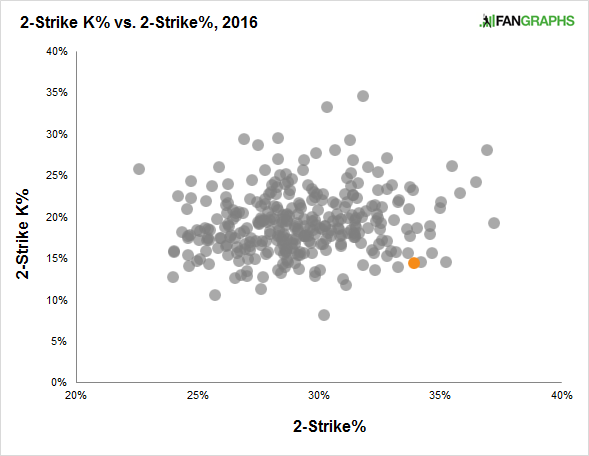 Although Boyd had a better-than-average contact rate within the strike zone, he had a considerably worse-than-average contact rate outside of the strike zone. That’s a hallmark of a pitcher without a putaway pitch. And related to all this, Boyd allowed more foul balls than most other pitchers. There’s imperfect contact there, but imperfect contact is still contact, and a foul ball extends any plate appearance. Boyd would need to turn some of those fouls into stares or empty swings. What should Boyd do? You could argue he might be able to improve here just by changing his pitch mix. Maybe he’s just been throwing the wrong pitches with two strikes. You could say Boyd could improve his curveball, and he wouldn’t disagree with you. You could say Boyd could improve his changeup, and he wouldn’t disagree with you. Yet there might already be something in motion. Justin Verlander last year threw his hardest-ever slider. Norris also developed a harder slider. Eno examined this at one point. Now let’s look at Boyd’s history. I can’t definitively tell how this pitch will continue to develop, and I can’t tell you whether Boyd will get the right feel for it. I also can’t tell, yet, whether a good version of this pitch would be greatly effective. It probably would, though, and given what we just saw with Verlander and Norris, I doubt this slider adjustment is accidental. Boyd has two fastballs he can locate, and his changeup works well enough. With a reliable breaking ball, I’m not sure what else he’d need. Maybe that breaking ball will still be his curve, but that newer slider has captured my attention. Boyd is still competing for a rotation spot. The Tigers aren’t handing him anything, nor should they, given how Boyd has performed in the majors so far. Underneath, however, you can see a pitcher on the verge of becoming a steady No. 2 or 3. Every young pitcher has it drilled into his head that it’s absolutely important to keep the count in your favor. Boyd already mastered the count part. Now he needs to take advantage of hitters in swing mode. Maybe the slider will be the key. Maybe something else. Maybe something. We hoped you liked reading The Other Interesting, Young Tigers Starter by Jeff Sullivan! A put-away pitch would surely help Boyd. But he’s also been crushed when the batter’s ahead: His 1.204 OPS in that split is 2nd-worst of the 193 guys with 20+ starts since 2015, and his 1.107 last year was #130 of 145 guys with 15+ starts. He did have a fairly low share of such counts last year, but not nearly enough to offset the results. Basically, he needs better stuff.